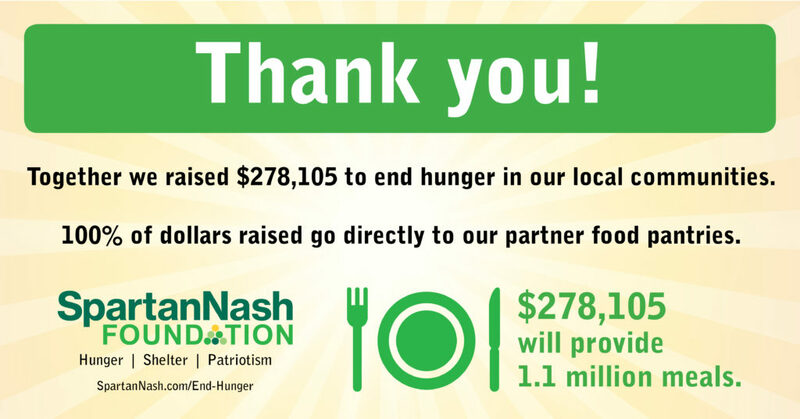 GRAND RAPIDS, Mich. – Together with its store guests and company associates, the SpartanNash Foundation’s scan campaign to provide hunger relief raised $278,105 to support more than 100 local food pantries and food banks in Michigan, Iowa, Minnesota, Nebraska, Ohio, North Dakota, South Dakota and Wisconsin. Simultaneous check presentations will take place companywide on Wednesday, Dec. 5, celebrating the success of the SpartanNash Foundation’s scan to end hunger and thanking store guests for their donations. The hunger scan was the fourth scan campaign the SpartanNash Foundation executed in 2018, raising more than $1 million and benefitting local Special Olympics, Habitat for Humanity, patriotic partners and local food banks. One hundred percent of all money raised is granted to the Foundation’s national, regional and local 501(c)(3) nonprofit partners through the generosity of store guests and funds contributed by SpartanNash and the SpartanNash Foundation. Between October 24 and November 4, store guests who visited any participating SpartanNash-owned retail store or fuel center in eight states had the opportunity to donate $1, $5 or $10 at any checkout lane, supporting local food pantries and food banks in the communities where the funds were raised. Each store selected the local community food partner its campaign would support, ensuring the scan to end hunger would have a significant local impact. More than 100 local food pantries will receive monetary support thanks to the scan to end hunger, with some SpartanNash stores – such as the five Dan’s Supermarkets in Bismarck, N.D. and Forest Hills Foods and the Knapp’s Crossing D&W Fresh Market in Grand Rapids, Mich. – teaming up to support the same food bank in their area. In total, the Dan’s Supermarkets raised $17,450, all of which will be donated to the Salvation Army. Forest Hills Foods and the Knapp’s Crossing D&W Fresh Market raised $13,000 on behalf of God’s Kitchen. A complete list of participating stores and their partner pantries can be found at spartannash.com/end-hunger. In total, the SpartanNash Foundation raised and granted $1,051,305 to nonprofit partners through its annual scan campaigns – the second consecutive year the fundraising efforts have topped $1 million. The SpartanNash Foundation was formed in 2015 and is the charitable giving arm of SpartanNash. It is focused on providing financial support to nonprofit partners who align with its mission to end hunger, provide shelter and support our military heroes. With a combined total legacy of more than 100 years, the SpartanNash Foundation represents the best of its predecessors, the NFC Foundation and the Spartan Stores Foundation. The SpartanNash Foundation is a Michigan nonprofit corporation and is tax exempt under IRC 501(c)3. It is a non-operating private foundation. To learn more about the SpartanNash Foundation, visit spartannash.com/foundation. SpartanNash (Nasdaq: SPTN) is a Fortune 400 company whose core businesses include distributing grocery products to a diverse group of independent and chain retailers, its corporate-owned retail stores and U.S. military commissaries and exchanges; as well as premier fresh produce distribution and fresh food processing. SpartanNash serves customer locations in all 50 states and the District of Columbia, Europe, Cuba, Puerto Rico, Bahrain, Djibouti and Egypt. SpartanNash currently operates 139 supermarkets, primarily under the banners of Family Fare Supermarkets, D&W Fresh Market, VG’s Grocery, Dan’s Supermarket and Family Fresh Market. Through its MDV military division, SpartanNash is a leading distributor of grocery products to U.S. military commissaries.